Are you like me? Do you listen to National Public Radio? When I am stuck in traffic, I enjoy battling fits of road rage by flipping the station to NPR to catch up on the day’s events, hear about a new book or movie that might be appealing, or rediscover the antiquated approach to news coverage in the U.S.: objectivity. It turns out that this behavior might reveal a shocking fact you or I never realized: we might be Saddam Hussein. "Raise your hand if you listen to NPR"
As we know, NPR has been in the spotlight following their recent firing of Juan Williams in response to his comments he made on Fox News’ “The O’Reilly Factor” about his fear of people in Muslim garb on airplanes. This has triggered a flash of debate among news outlets and members of the media as to whether Williams’ sacking was ethical or justified. Rove’s nugget was in response to Howard Dean’s citation of a 2003 University of Maryland poll indicating that 45 percent of Fox News viewers harbored misconceptions about the Iraq war, including the belief of a proven link between the war the the events of 9/11, compared to 11 percent of public radio and television audiences. I know, as a long-time Rove detractor, even this pushes the bounds of his audacity for me. Granted, he was probably just being sarcastic. More likely, given his track record as a career political strategist mixed with his regular stints on Fox News Channel, he thought it was perfectly prudent to bandy about outrageous claims to create a stir. There are many ways to dissect this statement, all of which make absolutely no sense whatsoever. However, to indulge Mr. Rove and his evidence-based philosophy we have come to expect, let us further examine how his latest quote could qualify as truth. Saddam Hussein cloned an army from his own genes and programmed them to listen to NPR so that they may gain an un-slanted perspective on American current affairs and attempt to somehow cost George W. Bush his reelection bid in 2004. This scenario likely doubled as a stretch-run media campaign tactic for Rove’s 2004 playbook, but became unnecessary due to the Kerry camp’s overall ineptitude to form a singular message. To see how large and impressive this fleet of Saddam Stormtroopers would have to be to equal 45 percent, media statistics at Current.com estimate that approximately 23 million listeners tuned into NPR programming during the 2004 election cycle. Do the “fuzzy math” and you see that 10.3 million Saddam Husseins were listening to NPR, according to Rove. Fact or fiction? Not sure, but the technology required to accomplish such a feat might also explain how Saddam was able to hide his weapons of mass destruction. Rove may have been misquoted and actually meant to say that “45 percent of NPR listeners were Saddam Hussein supporters.” This may be more likely, hard as it may be to believe, than cause number one above. His line of reasoning would surely be a reflection on the pillar of Rovian philosophy that “you are with us, or you are against us.” In this case, if one does not support the unjustified invasion of Hussein’s country, they must surely support the enemy-at-hand in Saddam. And they also, therefore, listen to NPR and other “liberal” media. The key flaw in this scenario is the assumption that if 45 percent of people supported the opposition, 55 percent were in favor of the Bush Administration. However, numbers from the U.S. Presidential elections in 2000 and 2004 suggested otherwise, yet somehow were not reflected in the results. (Yeah, some of us aren’t over it…though there is no evidence suggesting we’d be any better off if things had gone differently). 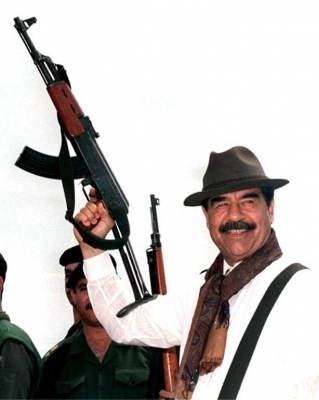 NPR listeners were possessed by the ghost of Saddam Hussein during random airings of popular NPR program, “Fresh Air,” following the execution of the Iraqi dictator in December 2006. In this argument, people were mesmerized by an undead Saddam Hussein and a host of other evil spirits during subliminal conjurations broadcast over NPR airwaves under the guise of interviews with jazz commentator, Kevin Whitehead. This effect is also rumored to have inspired NPR followers as they went to the polls and voted Obama into office in 2008. While this is perhaps the most difficult theory to prove Rove’s point, he has reportedly contacted television’s “Ghost Hunters” to investigate the matter. Also under investigation is a method to invoke the spirits of Ronald Reagan, Richard Nixon and John McCain to inspire Republican victory in next week’s midterm elections. Back to a more serious mood, I can’t believe there is actually the need to have an argument over which is more credible between the two, but here we are, and that in itself is a sad fact of the world in which we live. To think that a media outlet spawned by the same ratings-hungry network that produced gems like “Cops,” “When Animals Attack,” and “American Idol” contends to be more fair and reputable than outlets like NPR and the BBC is infuriating. Touting the superior tolerance of Fox News with Juan Williams’ comments about Muslims (and a subsequent $2 million Fox contract offered to Williams) is many things at once, but most of all, completely predictable. Making Americans afraid of Muslims is a primary tenet of the Fox machine, which was given a boost of quasi-credibility because this time, the remarks came from an NPR correspondent rather than the usual lineup of blow-hards. Republican lawmakers now also threaten to cut public funding to NPR in reaction to the station’s “rash decision” to fire Williams. The bottom line is that two wrongs will apparently make a right for Fox News, who will now continue to fuel the American fear factory with a reputable black man at the side of Bill O’Reilly, Glenn Beck, Sean Hannity, and Karl Rove. All of this in an effort to prevent Saddam Hussein—and everyone else—from listening to NPR in the future. This entry was posted in Politics and tagged Fox News, Karl Rove, NPR, Saddam Hussein by Troy Beckman. Bookmark the permalink. Traditional media are irrelevant. This includes Fox and NPR. Don’t allow them to distract you with this stupid sh**. Ask yourself instead why the Prog f**sticks in DC are even now attempting to bring the net under Federal control. For your own good, of course. And for the children. And forget about Rove. He now only exists as a bedtime monster for Prog bedtime stories. He is a pathetic figure from the past. He is employable only in the MFM. Don’t forget , I didn’t like Compassionate Conservatism either. But listen children, clinging rotely to SWPL is reactionary, not revolutionary. Viva la anarcho/monarcho/capitalist/revolucion!!11!1!!! Die hipsters !1!!1!!111! Put NPR and The O’Reilly Factor under each arm and jump, motherf***er, jump!!!!111! And another thing. This is the big truth. Juan was canned for daring to ask the eternal, selfish, greedy, capitalist question– is this all there is? For taking a second job, for improving the lives and financial position of his family with another income, for jumping the virtual fence of socialist solidarity on the Prog Plantation of the American Left– this is why he had to go. Silly Juan, didn’t he get the memo from Vivian? Cokie and Nina did. You pretend to work, and we pretend to pay you. And they all lived happily ever after. Much better to play shirtless beer-pong in the White House with the other metro-sexuals. Apparently Juan has some commercial value, he produces some real return on investment. How dare he leave the world of the non-profit, where pathetic white women with college degrees in Sociology are reassured of their relevance with consoling emails instead of a meaningful, quantifiable metric such as dollars or bonuses. Oh, the righteous stamping of little Prog feets. Oh, the righteous clenching of little Prog fists. Rhetorical only, of course. The borders of current American Progressive thought are to be secured of all independent ideas. Forget securing the Mexican border, this is the border the Prog must defend to the death. What if others decide to leave the plantation? Weback Juan crossando el rio. Turn loose the hounds.